The crowd that filled the GSIS Theater last February 11 can say “amen” to that. Until now, the overwhelming response to Pluwent expressed through social media sites (i.e. Facebook, Twitter, and Instagram) has taken Ryan Redillas (director and scriptwriter) by surprise. In a speech he gave at the end of the standing ovation Mr. Redillas fought back tears as he honored his father who inspired the teachings embedded in the play. He thanked everyone else. 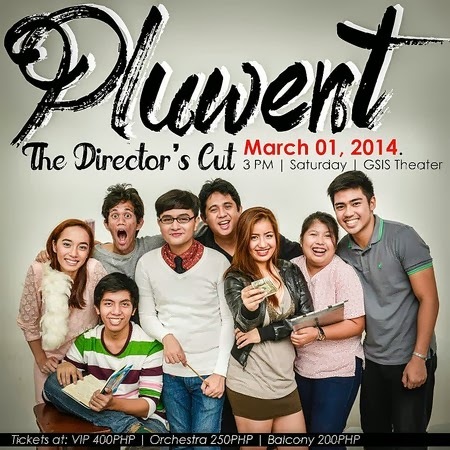 Pluwent is a play not to be missed; not for the set; not for the script; not for the actors; and specially not for the sheer experience of it all. For ticket inquiries please contact Kristin Bonifacio at (63 917) 840-6638 or email her at kristin.bonifacio@yahoo.com.